There are ” count ’em ” six wire transfer offices in Rodeo, population 5,000. More than $300,000 pours into Rodeo monthly at the Sigue office. A rough estimate puts revenue from migrants in Rodeo at nearly $20 million a year. That’s $20,000 per household from emigration alone. 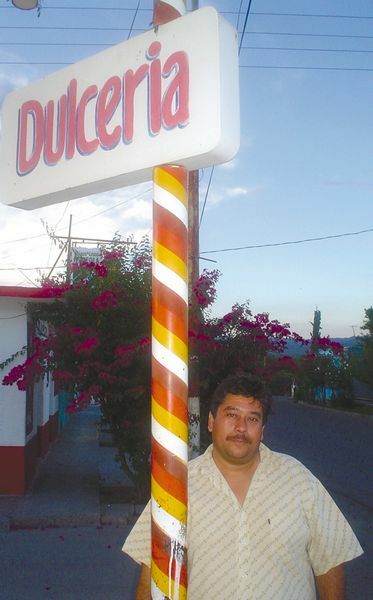 “If you want to send money home to Rodeo, just ask the operator, ‘put me through to the candy shop,'” said Benjamin Soria, 38, the owner of the “El Caramelo” candy shop and Sigue wire transfer office in Rodeo. Thirty percent of wire transfers come from Colorado, many from Aurora, Soria estimates; the rest originate in Minnesota, the Carolinas, Utah, California, Kansas, Texas and Florida. Rodeo is on the Pan-American highway, 95 miles from Durango and 100 miles from Torreon. Local activities include agriculture, livestock raising and an auto parts factory ” but that hasn’t kept people from leaving. More men leave than women; half of them are single. They come home in November and December, when feverish activity reminds residents of days gone by. “There used to be family feuds. Rodeo was just a lawless Wild West town,” Soria said. All over Mexico, students are studying English in preparation for college, to get a better job or to feel better prepared when they decide to emigrate ” legally ” to the U.S.
Solis, who lived in New Mexico and Kansas for 22 years, said although the two local mines are still active, the one above town is no longer running, and people are looking elsewhere. One alternative is education: her students are attending or have attended local institutions such as Tecnologico de Parral, and Universidad Autonoma de Chihuahua-Parral (UACH). Sergio Villalba is one of those students. A native of Parral, the 22-year-old works for the southern Chihuahua state attorney’s office. He’s studying for the graduate business school entrance exam and wants to do pursue a master’s in financial analysis at the Universtiy of California-San Francisco. Fabiola Armendariz, a 17-year-old UACH student from Parral, has a short-term goal for his English. Regardless of language, the buses continue to roll north. A few blocks away from each other, two rival bus lines vie for Parral’s Colorado workers. Los Paisanos sends one daily direct bus from Parral to Denver for $80. “Buses fill up during vacation. The Colorado and Kansas routes are my biggest sellers,” said Maria Aguirre, 52, who sells bus tickets in her natural food and drug shop. One bus rider, Reyes Renteria, is talking about Roaring Fork High School and the scenery around Carbondale. Renteria, 50 and a native of Hidalgo del Parral, is a welder and the maintenance man at a local junior high school. Renteria said the mines “are the only place to work around here.” He feels the urge to go north too, but for a different reason.